I put the memory card into a sdhc/USD Adapter. 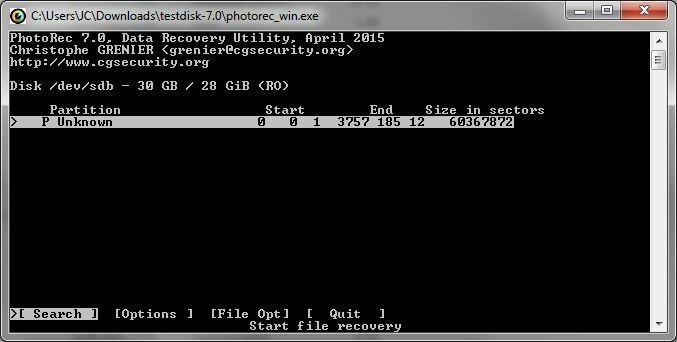 Windows 7 recognizes the drive and shows 12.4 of 28.7 GB free memory which may be correct. Unfortunatelly there a no files listed on the drive. 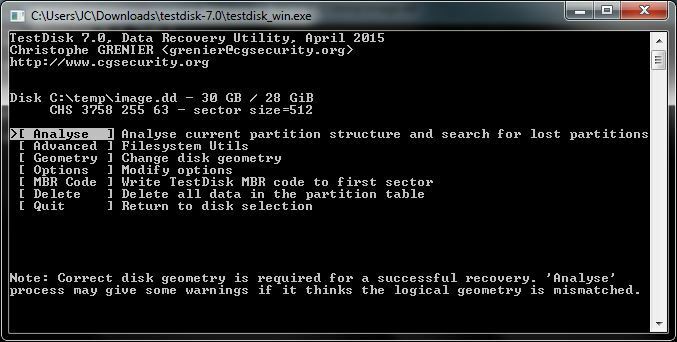 Then I used Testdisk to scan for lost partitions. I selected Partition type "Intel". My wife has the same smartphone and memory card and I've looked up the settings on that card (see below). Quick search and deeper search returned no results. 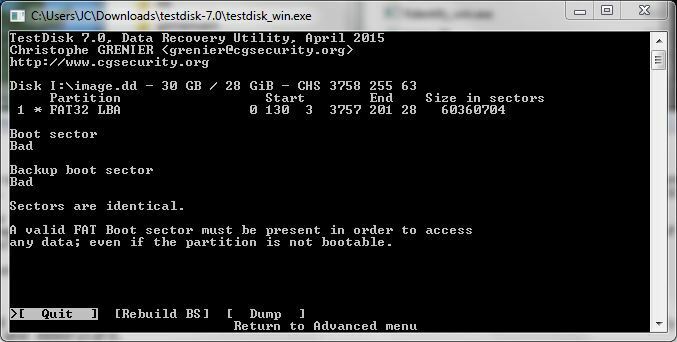 At this point I stopped working with the original memory stick and created an image with testdisk (partition type "none" & Filesystem Utils). I noticed that the cylinders in the image differ from the original memory card(3758 instead of 3757) - is this a problem? 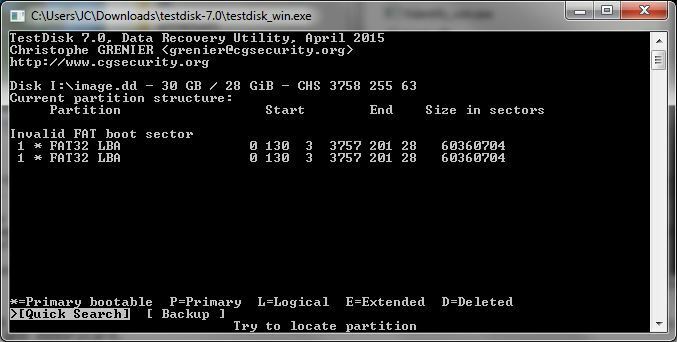 Nevertheless I tried to manually add a partition to the table. I looked up the partition parameters on the 2nd memory card and tried to recreate the partition. But I'm not sure I've done everything right and if that ever works that way with the image? After a restart the partion table on the corrupted card shows as following. Why are there two identical entries? Unfortunatelly I couldn't access any data und the boot sector is still damaged. I tried to rebuild BS, but get the errors: "No FAT found" and "Can't find cluster size." I'm at a loss what to do now. Are there any chances to restore the data or is the memory card physically broken? 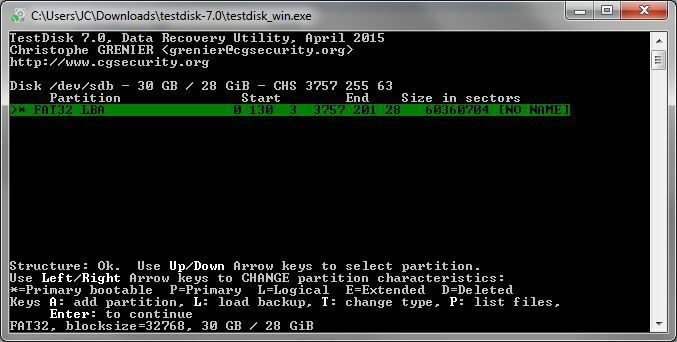 When testdisk shows the FAT32 partition, use 'p' to list the files. If it's not ok, use Deeper Search and try again to list the files. thanks for your reply. There is no option to list files for the corrupted card (picture 5). 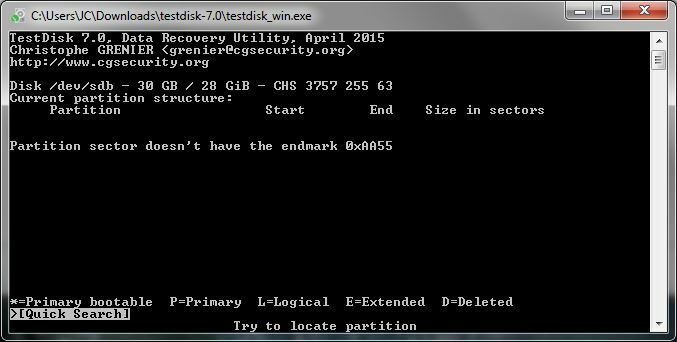 When I hit "Enter" to continue, testdisk searches for partions, but doesn't find any. Even the partition entry I manually added is gone after that (untill next restart).